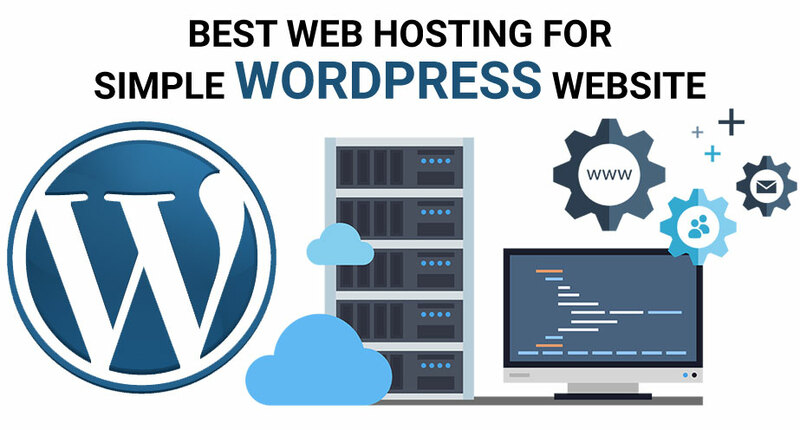 I come across this question a lot from my friends that which is the best web hosting for wordpress and to be honest it is a difficult question to answer. Not as such difficult but depends on what type of wordpress website you have to deploy. Some people just want to have a company profile type of website with typical 4-6 pages like home, about us, services, contact us. But some require an extensive website with number of products and their details as well. And some companies or individuals require an e-commerce website based on wordpress with Woocommerce plugin. So to make it very simple, any web hosting can work for the simple company profile type of website or a personal website with portfolio. You don’t get tons of traffic on such websites and they have very limited audience and to the point information is displayed. For simple websites like a company profile or to put a portfolio and resume of an individual, you can use any of the following companies. My company Synix Tech deals in web hosting and domain names since year 2003. So its been 15+ years of me serving quite a number of clients in Pakistan and United Arab Emirates. For Pakistani customers the pricing are converted into Pak Rupees (current conversion rate at 152 as of 31st January 2019) and they can pay easily with Bank Transfer (Standard Chartered, UBL, Meehan Bank) or they can use the Mobile Payment Gateway app like Finja Sim Sim. For the customers in U.A.E., the conversion rate of USD to AED is applied at 3.78 and the payments are taken via Bank Transfer (Emirates NBD). WordPress websites work perfectly on the normal shared web hosting and we also have the special wordpress web hosting packages. Following are the basic domain name and web hosting packages from Synix Technologies in Pakistan and U.A.E. * USD to PKR conversion rate is applied at Rs.152, as of 31st January 2019. The price could vary in future. ** USD to AED conversion rate is applied at 3.78. The prices are rounded off to the nearest five. Host Gator is one of the most famous companies for web hosting because of the attractive first year/initial pricing advertised at $2.75/month. Yes, there’s always catch! The price is valid for their most basic hatchling plan when the payment is made for 36 months. At the time of renewal, you will be charged $6.95/month. For a simple wordpress web hosting their packages are ok.
Is another very famous web hosting company. Their homepage attract a lot of customers because it boldly says that the web hosting price is only $2.95/month. But people forget to see the asterisk (*) with that pricing. That price is applicable for the first payment only of 36 months on their basic plan. At the time of renewal this same package will be charged automatically at $7.99/month. I personally don’t recommend it for wordpress web hosting, but a lot of people buy their web hosting package because they already have their domain names registered with them. Their package is advertised to start at $2.49/month only. Yes definitely it is the same as others. The basic plan with 36 months initial payment and later will be charged at the full price. They have a very affordable beginner’s package but the website speed is very limited and I have experienced slow browsing speed. I installed a wordpress website with premium theme and few standard plugins to secure the website. It was just ok, but not recommended for a good website. A normal test/trial websites or a personal resume website would work ok with them. 1&1 had been into the web hosting business for a long time. They were ruling the UK market and then went into the US market too. Their servers are configured in a different way and they don’t have cPanel as their hosting control panel. They have their own branded control panel from where you manage stuff. The database servers are different, the email servers are different and the web space is different. It is a great way to manage infrastructure and have separate redundant servers. Usually all the cPanel based hosting companies have the email, database and websites on the same shared hosting server. Anyway, you can try their web hosting out for normal website and their higher package can be used for e-commerce online stores too. Poor web hosting lead to hackings as well. WordPress updates their plugins and core from time to time to avoid such issues.